We recently decided to update our reference Blu-ray player to the new PlayStation 3 Slim (120 GB) model that came out over the late summer months. Ours arrived from Amazon.com and the box was almost tripped over in the hectic office we call home. For starters, we’ll cover the setup of the system from soup to nuts. Expect a shorter article than most because, basically, setup of the PS3 Slim is a complete breeze (even a caveman can do it). For those of us normally accustomed to new or updated technology being a complete hassle to get ready out-of-the-box, the PS3 Slim is a pleasant surprise. After readying space for the unit, and removing my truly awesome Samsung upscaling DVD player (you served your master well, little machine), I was ready to open the Amazon box and get started. 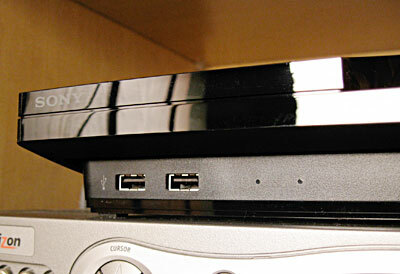 The PS3 Slim is much smaller and less intense looking than its predecessor with a smaller footprint and lower profile. It is a front-loading system and easily stackable if the unit is to be the topmost device in your entertainment array (don’t stack anything on top of it… the unit has a curved top not conducive to being on the bottom, electronically speaking). The unit can be placed on its side, vertically, using a Sony stand (not included), but I always think players tend to work better in the horizontal position (ahem… electronically speaking). 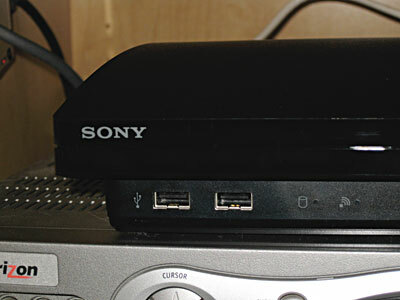 Out-of-the-box, the PS3 Slim unit comes with a single Dualshock-3 wireless controller similar to the previous model, an AC cord, a standard composite AV cable with a proprietary PS AV Multi-Out terminal connector, a USB cable for charging the wireless controller (and useful for connecting other USB devices) and printed materials: instructions in English/Spanish with a separate booklet for French gamers and cinephiles. Although it has Optical Digital Audio out, Ethernet and HDMI ports in the back, none of those cables are included with the PlayStation 3 Slim. I used my own HDMI cable from my previous disc player to provide the connection to my display… a Toshiba Regza LCD. Once the packaging was removed, the setup mainly consisted of attaching the HDMI and AC cables. After placing the unit on an old, dusty cable box (soon to be discarded hopefully), I was ready to do the onscreen/online portion of the setup. Upon powering the unit up, the PS3 Slim politely asks you to attach the wireless controller for charging and to complete the online setup. Nearly all PS3 functions are handled through the controller in the typical navigational layout for the PlayStation 3 called XrossMediaBar (XMB). 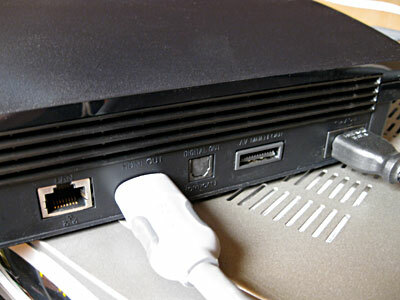 The PS3 unit itself contains only the power and eject buttons, located just below the front-loading disc slot. Using the arrow, X and O buttons, you can easily navigate through the setup screens after first pressing the PS Button in the center of the controller. A virtual keyboard is frequently seen during the setup and it’s fairly simple to navigate, similar to TiVo’s way of doing things. Audible controller sounds let you know you are navigating through each setup screen correctly. The image quality of the setup lets you know you are in HD territory… it’s beautifully done and designed. Onscreen menu commands let you handle all Blu-ray, game, multi-media and online shopping functions as well as offering a browser with direct access to YouTube videos and Sony proprietary media (the PlayStation Network). Through each step of the setup process the PS3 lets you know you’re in good hands… most functions will be handled automatically anyway, but you can tweak nearly anything you want and alter the default functions for media playback (video/audio), screensavers, and other options. Though I had mentioned early in this review I’d cover setup from soup to nuts, hardly any of the setup steps are necessary to delve into, and only those who really find it necessary to tweak the system to the specifications will want to take it a step further through the system preferences for video and audio output. Interestingly, there’s not much setup minutiae to cover… and that speaks volumes about the PS3 Slim’s simplicity and Sony’s entire approach to its device and operating system. After selecting language, video/audio settings and toggling the date/time screen to reflect current conditions, I was able to setup the wireless with ease… I’ll repeat: with ease! I use an older model of Apple’s Airport base station for my Mac setup and other wireless needs, and had absolutely no trouble at all setting up my hidden and protected wireless network… however, those of you with other wireless routers/base stations may find yours to be a different experience. Heck, I’ve setup TiVo boxes and had a much harder time with them recognizing my network right off the bat. So, without aggravation or frustration, and with noticeable speed, the PS3 Slim configured itself to work with my network and I was ready to dig into the Sony’s online world (PS3 games, movies, and other cool stuff that will be reviewed in another article). The final step occurred when I was asked, again, politely, by the PS3 Slim if I would like to conduct a system software update (to 3.01) that included security and feature enhancements. The time to download and install the software update was less than 5 minutes and it went very smoothly. The unit never lost my wireless signal nor experienced any interruptions of service (again, your wireless signal experience may differ). After that, it was playtime! I couldn’t resist first seeing a YouTube video (the browser is kinda primitive though… Eh, Sony, you could do better here and might as well just let each system come with a copy of Google Chrome in the future) and it was as good as an experience as I’d get off my MacBook connected to an LCD TV. Yet, although it did seem much clearer with less streaming video noise, I gather it will all depend on your wireless setup (b/g standards are supported by the PS3 and that means the n-standard will work, too) and the quality of the video that is uploaded to YouTube for viewing. The PS3 automatically plops you right onto Sony’s PlayStation page on YouTube, and gives you an immediate video that is crystal clear… but that’s probably by design and other videos may play differently… in further reviews I’ll attempt to find out. Now, for my favorite part of the setup: Most HDMI devices have the ability to recognize each other (if not by name, then by a device default tag) and I’d read criticism of the PlayStation 3 (old and new models) that insisted the unit could only be run by the wireless connector or the PlayStation Blu-ray remote control. Hogwash, I tells ya! 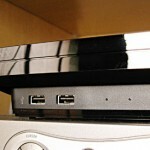 Though the PS3 Slim recognizes a wide array of Sony devices from PlayStation keyboards, microphones and headsets (wirelessly via the Bluetooth standard) it can also recognize in some, but not all cases, your TV, TV remote and other devices such as A/V home theater setups via the HDMI link. My older Samsung player was linked as a Toshiba “Regza-link” device and I could operate the player using the Toshiba remote control that came with the TV… not all functions perhaps, but all the most essential ones at least. 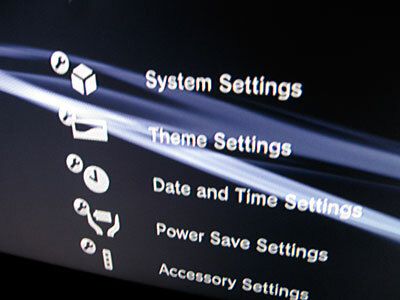 During setup of the PS3 you are not asked to link devices, but can through additional tweaking of the system preferences. I discovered, to my geek delight, that the Toshiba CT-90303 remote control I was using was NOT commanding the PS3 from the wireless Bluetooth standard but rather through the IR remote-to-TV connection! Trip-out! I loved this, and was impressed that I could not only navigate easily through the PS3 Slim’s menus, but I was able to control most media/disc functions as well. So, after a breezy setup process I felt I’d received a real bonus in getting my TV’s remote to operate the PS3 Slim… and now have one less controller to crowd my coffee table. I didn’t know about that RGB mode. Thanks for posting that! Thanks for the tips… very good ones! Anyone else with tips for the PS3 Slim… please comment on this page. As I work my way through the device’s features, I’ll incorporate some of your tips. Thank you, readers! Do yourself a favor and get you PS3 off the top of that cable box. Those cable boxes throw off a good amount of heat, hence all the ventilation. I MIGHT not be a problem, but better safe than sorry. Also, about youtube. The defaul page you go to on PS3 now is youtube XL, and it’s HORRIBLE. Use the PS3 browser to go to google or whatever, search any youtube vid (not the main page, because that will take you to XL, click on a specific video from google search), and that will take you to the normal web browser version of youtube, which works the same on PS3 as it does on a PC, and it works nice and fast. The bookmark any normal youtube video, so you don’t have to search again. And just like a PC browser, in tools, you can make any web page your home start up page. Also, since you are going through HDMI, go to display settings and turn RGB to Full instead of limited. It makes a HUGE difference in colors and blacks.